Survey scans courtesy of RadioWest.ca and courtesy of Gary Pfeifer & the ARSA site. "Tops on the Teen Scene" & "I Love Mr. C-FUN" courtesy RadioWest.ca. Tinting by yours truly. "Summer a-Go-Go" ad is from the Vancouver Times. Courtesy of Larry Morton. 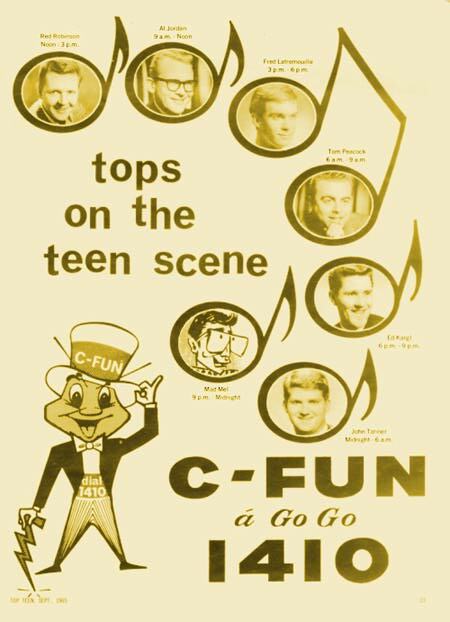 Mad Mel joined C-FUN during the Spring of 1965. Unlike the station's other DJs who were commonly known as "The Good Guys", Mel earned a spot as C-FUN's "Bad Guy." By the Fall of 65 Mel was gone, although he could still be heard in C-FUN ads for the Bad Boys Rag Shop, a new trendy clothing enterprise in which he was involved. Short as his stay with C-FUN was, it was memorable. Mel later moved to Australia where he lives to this day. Few pictures of Mel have turned up and when they do his features are hidden by huge glasses, or a long black false beard, sometimes both. Likewise, audio of Mad Mel on C-FUN is scare. Below are the few and very brief snippets thus far found. This was the famous intro to Mad Mel's show that contained the line "OK Mel, you can come out of your cage now. It's time to start the show." Another short intro to Mad Mel's show. This all-too-brief piece is compiled from a number of short bits, then pieced together. In it Mad Mel is broadcasting from the C-FUN studio attempting to play his recent interview with Paul McCartney. But Mel is having problems queuing the interview and so calls upon his alter-ego "Granny Scoopshovel" to get "the machines" working. We hear a brief C-FUN jingle after which Granny, having solved the problem, begins playing the tape. We hear the voice of Roff Johannsen introducing the interview and then we cut to a part of the interview, which takes place at an airport. 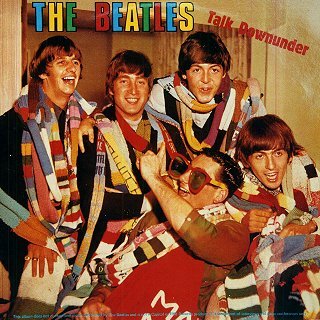 As it turns out, Paul McCartney is actually interviewing Mad Mel! We also learn that it's Mel's birthday and he's turned 19. Not much else is known of the circumstances surrounding this ocassion. Thanks to Alex Galbraith for the audio and to Larry Morton for editing.